Baby Taylor VS Little Martin - Which Is The Best Acoustic Guitar? Baby Taylor VS Little Martin – Which Guitar Is The Best For Young Players? Let’s Find Out! I have a true affinity for small guitars. My first guitar was a 3/4-sized dreadnought, on which I learned a hundred songs and wrote a hundred more. I still keep one around, my “junker” guitar, sitting ready in a corner for those moments when I have a sudden song idea I need to test out, or for when I want to take a stroll to the park while picking out some good walking riffs. I have seen small guitars used to great avail by talented children at recitals, open mic giants stirring crowds to dance, and traveling teachers on a 1,500 mile bicycling journey during summer vacation. Both the Little Martin LX1 and the Baby Taylor BT2 are prime examples of excellent small acoustic guitars, either of which I would be delighted to own. Little Martin LX1 review – best acoustic guitar? The Little Martin LX1 acoustic guitar features a modified concert style body made with a solid Sitka spruce top and mahogany laminate back and sides. It is Martin’s smallest guitar, yet keeps true to manufacturer’s quality standard with durable and well designed construction throughout. Adding to the appeal the LX1 has as a travel guitar are the birch laminate neck and the Richlite fretboard. When exposed to fluctuations in temperature and humidity, the neck is often the first part of an acoustic to warp. Martin’s birch laminate and Richlite are both resistant to damage caused by weather, allowing peace of mind when taking this guitar camping or on the road for extended lengths. Whether you’re thinking of buying the LX1 for a child or for yourself, it will show itself to be an instrument that feels good to play. The modified concert body is even smaller than a 3/4-sized dreadnought, and the small scale of the neck is great for players with smaller hands and shorter arms. Richlite, a synthetic material made of recycled paper and resin, creates a fretboard that has the look and feel of ebony, having good response and a smooth, comfortable playing surface. The LX1 is set up well, with the action set just right so as to avoid fret buzz yet be playable by a beginner’s underdeveloped fingers. The Little Martin LX1 acoustic guitar is a small instrument with a big voice. While you might not fill a hall with this little guitar, you can surely sound out around a campfire or ring clear in a small unplugged jam session. The clarity and crispness apparent in the tone of the LX1 make this a great guitar for a beginner to easily hear where they may be going wrong. Sitka spruce is a very bright sounding wood, and this could overpower the Little Martin to make a guitar of grating tinniness. However, the mahogany sides and back dampen that brightness and balance the LX1’s tone with a decent low and mid-range response. While it might be a little glassy in the higher registers and lose some of its complexities higher up the neck, you’ll have a hard time finding a travel guitar that sounds as loud and clear as the Little Martin LX1. The Baby Taylor BT2 is a beautiful 3/4-sized dreadnought made with a solid mahogany top. It has laminate sapele back and sides, a solid sapele neck, and an African ebony fretboard. These durable woods will hold up to the bumps and bangs that accompany any travelling or beginning musician, and look and sound great too. However, with the proper care and attention you should pay any instrument, the Baby Taylor BT2 can retain its form and function for years. Coincidentally, the acoustic I play the most shares a lot of the same specs as the Baby Taylor BT2, including the mahogany top and black ebony fretboard. Ebony is my favorite fretboard material; it’s responsiveness and natural oils allow my fingers to fly from fret to fret and bounce effortlessly from chord to chord. The action of the BT2 is perfect for my playing style, which involves a lot of hammer-ons and pull-offs in open tunings. It’s not too high to be difficult to play, but not so low as to generate any extra fret noise. Taylor’s BT2 acoustic guitar also features an unusual system for mounting the neck; instead of the usual heel, it is attached with two bolts. Some may find that this throws the appearance of an otherwise classic looking acoustic, but it enables easy access to the higher frets, which you will really appreciate as you explore the range of tones the BT2 can produce. Mahogany and sapele as tonewoods share similar characteristics. They both produce a sound that is rich in harmonics and overtones, and typically exhibiting a lot of depth in the low- and mid-ranges. The solid sapele neck adds high-end sparkle, and when carried by the ebony fretboard, the resultant tone is warm, rich, and woody. The arched back of the Baby Taylor BT2 adds to the volume of this little beauty, and from fret to fret you get a bold, dark tone with great sustain. I love this guitar for fingerstyle and playing in open tunings. Both the Baby Taylor BT2 and the Little Martin LX1 are great guitars for many occasions. As a child’s first guitar, there are few on the market of greater value than these two competitors. These are the kind of instruments worth holding on to even after you’ve moved on to bigger and better guitars. They’ll retain their value and condition over the years, and especially in the case of the Little Martin, will probably sound better as they age. For travel, the Little Martin LX1 might hold up to the rigors of weather better than the Baby Taylor, and being a little smaller, may fit better in the tightest of traveling conditions. Both guitars ship with padded soft gig bags, but taking the solid neck of the BT2 into consideration, you might want to upgrade to a hardshell case. Being products of Taylor and Martin, both the BT2 and the LX1 acoustic guitars are going to be quality, and either one you end up with will not be a disappointment. In terms of pros and cons, I would say the worst feature of the each balances out its own best feature in a way that makes sense for the individual guitar. The solid sapele neck of the Baby Taylor BT2 makes it prone to warping from weather damage, but at the same time balances the tone by adding high-end brightness to an otherwise low-end warm guitar. Likewise, the synthetic Richlite components of the Little Martin are unappealing to guitarists like myself who prefer natural wood, but have the added bonus of making the LX1 extra durable without subtracting too much from tone. The main factors to take into consideration when choosing between the Little Martin LX1 and the Baby Taylor BT2 are: construction, tone, and materials. It’s a matter of preference among these three areas in which these models differ. For some, the bolt mounted neck of the Baby Taylor may be a deal breaker. For natural wood lovers, the synthetic Richlite fretboard of the Martin might be a problem. Conversely, you might love the access to the higher frets that accompanies the BT2’s lack of a neck heel, or you might be drawn to the factor of sustainability resultant of Martin’s use of Richlite in the LX1. Considering both guitars are solidly built, I would say that tone is the biggest deciding factor between the two. Different people like different guitar sounds for different reasons, and there is no right or wrong answer. Between the LX1 and BT2, your choice is essentially: bright and crisp, or dark and warm? Personally, I have always liked acoustics that have a very present low-range and are heavy in overtones. Between the two, I favor the tone of the Baby Taylor. It’s dark and warm tone is great for fingerstyle, strumming with or without a pick, and playing in open tunings. It’s very responsive to natural harmonics which sing out beautifully at each interval. If you’re a player who likes the sound of a crisper acoustic, the Little Martin LX1 would be the way to go. The clarity of the LX1 is great for riffing and soloing in many genres. It will sing out blues licks, jazz chords, and rock riffs with equal strength and shine. In a street performance, you might find it lacking a little in its ability to fill a loud environment without sounding too tinny, but for all other purposes it is a great all-around small guitar. 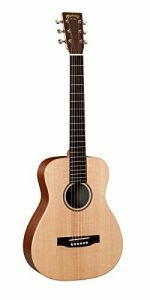 In short, I would recommend the Little Martin LX1 for students of all shapes and sizes, children, and for hobbyist guitarists who want to play on camping trips without the need to worry much about the resilience of their instrument. The Baby Taylor BT2 I recommend for anyone seeking specifically to add a smaller guitar to their collection, for street performers who want a small guitar with a big voice, or for professionals who want an acoustic to treat a little rougher and loan a little more freely than their usual instruments. 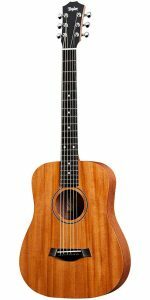 Top affordable acoustic guitars you will love!